My sister in law recently gifted me her old seed collection. I guess you could say she's an old hippy. She met my older brother in 1966 at Upsala College in East Orange, NJ, and some of these seeds date back to that time and place. She added to her collection until seedless weed became the norm, so this collection dates from ~1966 to ~1990. She lived in Rhode Island most of that time, and she saved seeds from what she thought was good weed. She unfortunately didn't catalog them, but they were kept in an airtight jar in her dresser drawer all those years. I wish you could get a good whiff of the contents of this little glass jar. It takes me straight back to the 1970s, and the landrace Mexican and Colombian sativas that I used to smoke. Smells exactly as I remember that weed: wood, slight muskiness, slight sweetness, slight earthiness, with a beautiful peppery incense backdrop. It's sublime. So I need to develop a plan to methodically go through these seeds and do my best to germinate them. I think I'd be happy with a 1% germination rate, which would still be a fair number of plants to look through. I'll start by sorting them based on size, color, structure and condition (many are cracked). I then need a plan of attack for germinating them. Is it feasible and practicable for an amateur such as myself to do tissue cultures? What's my best bet for germinating these seeds? Last edited by Marcus_in_the_Darkus; 04-07-2018 at 05:28 AM. Being stored in her dresser drawer, I kinda have my doubts if any of them make it. I hope I'm wrong. It would be great to see what you get if they do germinate. You may or may not know but i would reccomend Ga3 buddy. I bet you get some to spring into life. That's an awesome gift you received there Mark. Here are two plants from very old seed. I know I got them when I was a mod at Cannacollective (maybe 6-8 years ago) and they were old then. In fact, i almost threw out the pack because half were just dusty fragments of seeds. 5 were identifiable as whole seeds. I pulled them out December 1st I think. I floated them in very dilute H2O2 with a dash of maxicrop. 2 fell apart and 3 looked like maybe they were viable, so I prepared some rooters by soaking in a dilute enzymatic cleaner and squeezing them until DAMP, then putting the seeds in them and sealing them in a ziplock bag. 2 miraculously came up. Why would you recommend gibberilic acid ? And at what strength should we use it ? Ever used it yourself ? What dilution ? Id suggest four different batches at 100ppm 200ppm 350ppm 500ppm.. and time to work into the shell, a month isn't waiting too long.. it works and apparently on really old seeds but for ones I used on (20year) I had as much success with h2o2..
My seed collection goes back to 1977 when I started saving and freezing seeds. In the freezer they last indefinitely. Like, forever. I still get over a 60% germination rate. I listed my older seed catalog over on 420 mag in a thread called "Original source seeds from the 70's" under my alias as BigSur there a few years ago. During germination, I use an H2O2 spray, which is 1 cup of 3% hydrogen peroxide in a gallon of water. That is enough to kill the dampening off fungus and not damage the seedlings. 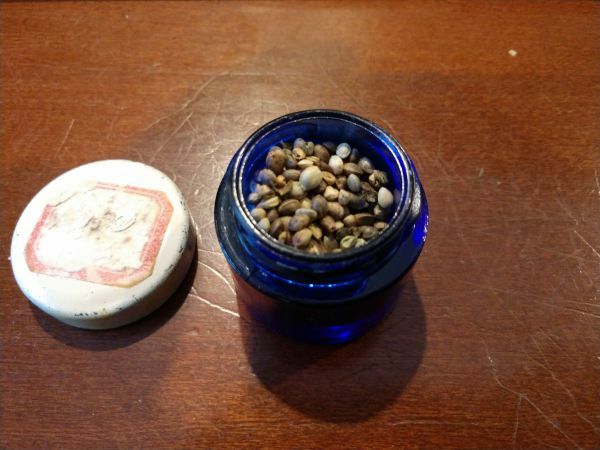 Your older seeds may not have enough energy to throw the seed caps, so you may want to help them open with tweezers. You will also have to nick or file the seed coats as the resin will have dried to a hard crust that water cannot permeate. They have to get to water to germinate. I put the seeds between sheets of wet paper towels in a warm 70deg. F place, covered to keep them in the dark. Chances are that the seeds are gone being kept at room temperature. Generally they will die at a rate of about 50% every 2 years above 60 deg. F. (rates from scientific studies). Below 50 deg. F they begin to last longer if kept DRY. Moisture is critical, until you get below freezing. At about 0 deg. F the air moisture is not an issue any more. Which is why I keep my seeds at 0 deg. F. (which is also the temp that most freezers in the US are set to). I also store rice kernels with them to take up any moisture. Last edited by Big Sur; 02-09-2018 at 09:07 AM. The psychedelics issue is one of civil rights & liberties"
"The notion of there being illegal plants and animals is both ridiculous and obnoxious"
I've heard good things about just dropping the seeds in a worm bin with nothing else. Supposedly the good bacteria beat out the bad and you get better results then trying to just sterilize the seeds. I have never tried this, just read on it. I've been following (and posting in) that thread. Lot of good info. Looks like my best bet is to get some worm bins going, even though I grow hydroponically. Any suggestions on how to build a relatively simply and low-drama worm bin? I'm under the impression that it would take me the better part of a year to get it to the point where I can use it to germinate seeds.